Lomography RingFlash. Flash circulaire adapté aux gros plans et aux photos de soirée.Créez des portraits Fisheye incroyables avec le RingFlash. La peau est plus brillante, le reflet s'inscrit dans la rétine de vos sujets, et des ombres folles apparaitront derrière eux s'ils sont devant un mur. All included accessories, if any are displayed in photos. Includes only what is pictured. Any item sold by the Seattle Goodwill is eligible for local pick up at our warehouse. SEATTLE GOODWILL'S MISSION. It takes only 2 pcs. of AA battery (not included). It can be acted as a slave flash. There is a sensor on the front andcan also be triggered by external flash. Skin is radiant, eyes have circular reflections, and crazy shadow effects are traced around your subject when they¿re against a wall. Solid color gels and multiple color gels can be used to toss colored light and create seriously groudbreaking and unique images ¿ including shots with four distinct and totally mind-blowing colors! 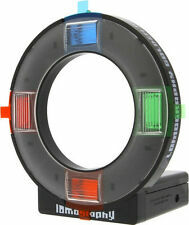 Description : This unit with a built-in sersor can be triggered by another flash unit. 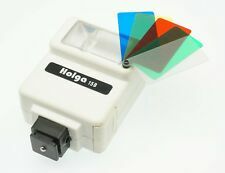 It can be used as fill light, side light or back ground light. With mounting foot it can be mounted on a camera with hot Shoe and can be used as an ordinary flash unit. 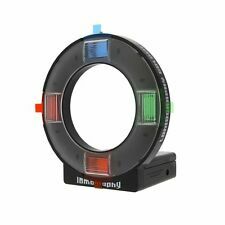 There are FIVE color filters, namely red, blue, yellow, green and diffuser available for changing the color of the white daylight emitted by the flash. Specifications : Guide number : 12 (ISO 100, meter) Light Angle : 50 degree Horizontal / 40 degree Vertical .